Grab a tub: a washing up bowl, a cardbaord box, a storage box. You need something which is large enough for your children to get their hands inside so they can have a good dig around and with sides high enough to hold the contents but low enough so your children can sit beside the box and reach inside easily. Add a main ingredient: water, sand, cotton wool balls, dry pasta, oat flakes, shredded paper are all great options. You want something which is interesting to feel and manipulate. Mix in some treasures. It’s always fun to hide things inside the tub for the children to discover: ice cubes in water, little toys, fir cones and shells. Have some tools on hand. Sometimes children need nothing more than a tub of water to splash about in but you can extend the play and learning possibilities if you provide some items they can use with the tub. Scoops and spoons for digging, buckets and pans to fill, ice cube and dip trays for sorting, jugs for pouring, tongs or a fishing net for picking up. Let the children play. The idea is to provide a tub of interesting textures, shapes and sounds and let the children explore. Sit back and observe them play and notice how they chose to investigate the tub. Are they interested in pouring, or counting, or collecting? You can chat to them while they play and look at the things they discover but sometimes I think it’s good to sit back and let the children lead the way. 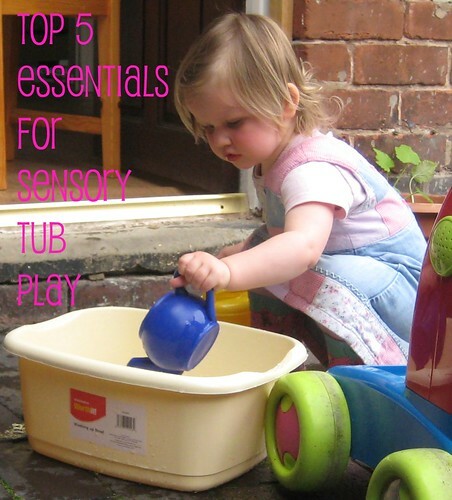 Do you have any favourite ingredients for sensory tubs?